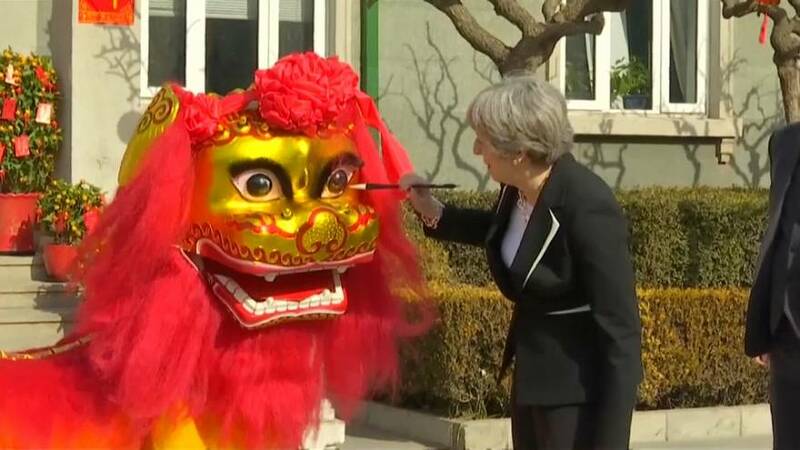 At the end of her three day trip to China British Prime Minister Theresa May was treated to a lion dance in Beijing to bring her good luck and fortune. Certainly, her avoidance of human rights issues seems to have gone down well in China's state media. The Global Times newspaper called her pragmatic for avoiding what it called radical public opinion - shorthand for pro-democracy activists in Hong Kong. May also found time for a respectful visit to the City God Temple in Shanghai. Her visit has yielded new trade deals worth seven and half billion dollars to Britain which is trying to reinvent itself as a global trading nation after a 2016 referendum decision to leave the European Union. China, the world's second-largest economy, is high on the list of countries that Britain wants to sign a free trade agreement with. Already 50,000 British businesses import goods from China and more than 10,000 sell their goods to China. more than 1 billion pounds and market access, that would lead to 890 jobs, it said, without giving details. China sees Britain as an important ally in its call for more open global markets, despite widespread concerns in the foreign business community about the difficulty of operating in China, and both countries refer to a "golden era" in relations. Still, Chinese Premier Li Keqiang told May on Wednesday that China's relations with Britain will remain unchanged through Brexit. But addressing business leaders in Shanghai on Friday May looked forward to a post Brexit era with a message clearly opposed to President Trump's isolationism. "We're seizing the opportunity to become an ever more outward looking global Britain, deepening our trade relations with nations around the world, including China," she said. "I've seen our businesses making new alliances, and forging new partnerships. I've seen our people learning about the world through education and about each other through culture." And China's welcomed Britain's call for more open global markets along with May's support for its new Silk Road project connecting it more closely to Europe.